This quote by the chef that brought French cuisine to America in the 1960s and 1970s perhaps perfectly sums up a book by a man trying to bring cheap wine to the world of wine writing. Jeff Siegel, aka The Wine Curmudgeon, doesn't need to bring cheap wine to Americans because, outside the sphere of connoisseurship to which you and I belong, cheap wine is what regular Americans drink. The average amount spent on a bottle of wine in the United States is somewhere around $6-$7 per bottle. Wine doesn't have to be luxurious, expensive or from a famous region to complement a meal, a date or just an evening by oneself. It is through these, often, simple wines that Americans experience, savor and learn about fermented grape juice. 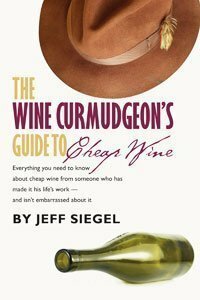 The Wine Curmudgeon's Guide to Cheap Wine offers a look into the world of cheap wine, a world often ignored by those of us that write about wine, and why cheap wine matters. The book started as a Kickstarter project and is a natural extension of Jeff's wine blog, The Wine Curmudgeon. Jeff is a true consumer advocate. He doesn't care about offending wineries, receiving samples or making a name for himself. He doesn't concern himself with assigning points to wine or telling his readers what they should like. He truly cares about suggesting wines that consumers should spend their hard-earned money on and reaffirms them to trust their own palates. He knows his wine and is a fan of well-known and expensive wines (if what's in the bottle is high quality). But Jeff's passion is cheap wine. Wine that doesn't cost an arm and a leg, but over delivers on the quality front. First, I want to make clear that I am a friend of Jeff's and I contributed to the Kickstarter project. I was one of 113 people that contributed a total of $8,052 to Jeff so that he could write (and publish) the book. I knew he would send me a copy even if I hadn't paid for it (I did receive a free review copy, but the hand-signed copy I paid for is in the mail...), but I felt that the project was worthy of my money. I have shelves of books written about all sorts of vinous topics, but none focuses on cheap wine. Cheap wine is a very important segment of the wine industry, yet it is shunned by the experts and critics. The book is not meant for industry insiders, but many insiders would benefit from reading it. It is not meant to train you to be a sommelier. It is a good read for the casual wine drinker that wants to learn more about wine and get some insight into the question, "why is it okay for me to drink cheap wine?" The book is divided into five chapters, plus an appendix-like section titled "Other Good Stuff to Know." The writing does come across as stream of consciousness and scattered at times, but it works. Chapter's 1, 2 and 3 provide a history and background of sorts surrounding cheap wine and how it evolved into the palatable beverage you'll find on the bottom three shelves of your local liquor or grocery store. These chapters are like a foundation of a house; somewhat uninteresting, but important. Chapters 4 and 5 are where the book gets interesting. These two chapters offer some advice on how to buy cheap wine. Jeff offers simple, but useful advice on how to make good choices when choosing from a seemingly infinite number of choices of cheap bottles of wine. Befriending a retailer, the benefits of blends, buying wines you know you like but from different producers and choosing wines from less-heralded regions are just some of the pieces of good advice this book has between its covers. Regional wine, in fact, may well lead to the thing that the wine business fears most—democratization, in which consumers drink whatever they like from wherever they like, without interference from the Winestream Media, wine retailers and distributors, Big Wine, and the three-tier system. Every person who buys an Indiana traminette or a Missouri chambourcin or a New York baco noir is reducing the power and the importance of the oligarchies that have run the wine business in the United States for 40 years. And wouldn’t that be a good thing? CWP: Nice write up on a fine gentleman in Texas. I have known Jeff for quite awhile and he has preached regional wines as long as I have known him. I agree with him 100%. There are many beautiful wines produced all across America. One that comes to mind that I tasted in Minnesota was Marechal Foch. It was a beautiful red from a cold climate. It was, at the time, the only winery in Minnesota. It was the Alexis Bailey Vineyard winery. He was quite a pioneer.